So you have a plan… Great! Your brainstorming session yielded some great ideas that are worth exploring. Now, on to finding the cream of the idea crop. Regardless of final output (print or digital), a minimum amount of sketching is involved. 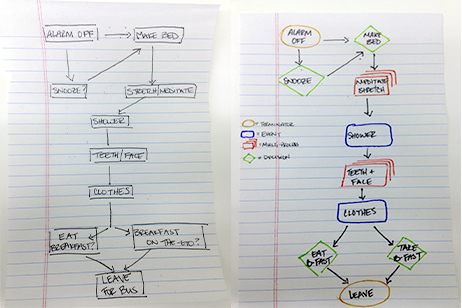 Help your team visualize the final product by going back to the drawing board… literally. Sketching can be done a variety of ways, depending on the product. One thing rings true: start simple. By “simple,” I mean extremely minimal. Outline the framework by using very basic shapes to illustrate content placement. (ex: Website wireframes or process flow charts). No need for superhuman drawing skills. At this early stage, the goal is to develop structure and primary hierarchy. OmniGraffle has an awesome range from the super simple to the uber detailed. Create anything! Make process graphics, decision trees and wireframes with the click and drag of a button. With this sleek online application for web and mobile wireframing and prototyping, bring your sketches to life by uploading and simulating the interaction between sketches by adding hotspots. This programs turns your static screens into interactive prototypes with gestures, transitions, and animations. Collaborate with teammates by conducting user-testing and leaving comments in real time. Take that whole pen and paper experience and throw it on an iPad to capture ideas quickly. All the ease and flexibility of hand drawing in a digital format. Let’s backtrack a bit and recap why providing content digitally is so important: Digital content has a sustainable and measurable impact. The information is always in our back pockets via our mobile devices. Who wouldn’t want that type of exposure and access? We have had the pleasure and opportunity to create the LEED in Motion report series. Super awesome info on everything from LEED in retail to LEED’s impact on people and places, both domestically and internationally. This series was presented at conferences and events as colorfully-illustrated, saddle-stitched handfuls of informative goodness on recycled paper. People loved them… Loved them so much that one of the problems we’d face at these events is that we’d run out. Make it mobile device ready: One tell-tale sign that we’ve arrived in The Future is that our mobile devices are pretty much extensions of ourselves. Devices are always on us: in our pockets, in our bags, and most often, in our hands. It has become imperative to always include some type of mobile strategy within any project deliverable, making sure pertinent information is also right there in consumers’ hands. So, making the LEED in Motion reports readily-available in any digital circumstance/event was a premier goal. Be responsive: One of the great things about life is that we’re given choices. Among those choices is the option to choose our devices and how we access information. Well, we want to be ready no matter what choice you make. Our content needed to be flexible to accommodate whatever platform it is viewed upon. Choosing a platform that is able to shift and provide optimal viewing across devices—desktop, phone or tablet—is of utmost importance. User-friendly content: Swipe. Swipe. Pinch. Swipe… This is how we talk to our main tools of global Internet access. It is with these gestures in mind that we have to re-create content that was once flipped page-by-page. Consuming large amounts of text via these tools is just not practical when on-the-go. With the new LEED in Motion reports, the content format has been improved for efficiency and easier consumption, finding the perfect balance between not-too-much and just enough. Lest we not forget the impact social media has on our lives. We need to be able to share things we’re excited about with the tap of a button, so including social integration is a must. Keeping those goals at the forefront of our brainstorming, we were able to come up with some pretty sweet digital solutions, not just for our LEED in Motion report series, but our LEED collateral suite as well. Besides being more sustainable by eliminating the need for paper and ink, the biggest benefit is that digital information is measurable. We have the opportunity to gauge how effective our content is. We can know what really matters to you, the consumer, and tailor our information so that it both useful and informative for you. Social media needs no introduction. At this point we know the basics, but this ever-changing, lightning-pace field is no one-trick pony. My advice: take the “guru,” “maiden,” and “specialist” tips into consideration, but find what works for your brand. There are endless tips and tricks out there, but the foundation of solid social media management boils down to effective communication and organization. I remember interviewing for this position one year ago, and while I had no idea what to expect, I was confident in my social networking skills. I described myself as a “connector, networker and engager,” alert and deliberate in linking those with questions, those with answers, and those with shared interests. These are just a few of USGBC Studio’s general tips for making your social media platforms active spaces of brand-building conversation. Some days, this job requires me to do a lot more listening than talking. I’m often asking myself the question, “What is trending?” We like to function on a 60%:40% Rule: roughly 60% of our content is strategically planned and often created by our marketing team; then, we leave 40% open so that we can incorporate LEED into part of a larger, timely, more relevant conversation. These topics may be related to a story on environmental activism; a major legislative announcement, or even a press release/media announcement by a partner organization. Planned content includes campaigns, blogs and pre-conceived goals/initiatives. Any international expert will tell you that technology—and now social media—have expanded globalism in ways we never imagined. It’s important to think about content creation and promotion on a global scale. This includes something as simple as language transcriptions and cultural sensitivities, to time zone considerations when posting. As the LEED market continues to grow worldwide, it is important for me to tune in to how green building is being discussed and what people are saying about it—the praise and the criticism. Be a connector (2D &3D). Whether I’m grabbing my morning coffee from the kitchen or live-tweeting a major event, I’m always trying to engage with my peers. Sometimes that may be my coworkers or colleagues, chapter members and volunteers, even untapped audiences who know nothing about LEED or the industrial sustainability movement. Social media has a ripple effect, depending upon who is amplifying your message. For example, let’s say there is a LEED certification ceremony tomorrow afternoon in the Atlanta region. I want to be sure I’m tweeting at and tagging all those who would be interested in covering or being part of that particular event. Ideally, I don’t even have to do major research prior to learning this information—I know exactly which reporters, local organizations, and legislative representatives are active on social media and guaranteed to spread that announcement further. Which Twitter handles I want to Direct Message, encouraging attendance. Any handles of keynote speakers, or leaders, in so that I can tweet at them during the launch (in the hopes of a retweet)! Whom I may want to congratulate or acknowledge for their efforts in hosting us (this includes hotels and conference spaces—especially if they are LEED-certified)! It’s about being aware of the connections that should be made, and setting up a strategy to make those relationships happen. Sometimes this happens quite randomly, in passing. Other times, it requires a lot more creativity (and charm). I am the voice of my organization on social media: that’s huge! Of course I maintain the utmost professionalism, but I don’t pretend to be a robot, and it’s not in my best interest to act like one. I give my organization a personality and a voice that has to connect audiences across industries, nations and political affiliations. There are many ways I try to engage with individuals on light-hearted matters still relevant to our mission. I can do this through creative language; sometimes I make LEED puns (never gets old); sometimes I draw on pop culture references; regardless, there is definitely a little bit of me in every post! Just the right amount of wit doesn’t hurt, either. Coming up with a theme based on “convergence” ended up being an interesting process. By “interesting,” I mean not at all what I expected. I’m sure you’re familiar with the saying, “There’s nothing new under the sun.” The first thing I did when I heard the proposed theme was Google it. I wanted to see what imagery had already been run into the ground, like the obvious notions of one-point perspective / “converging” lines / groups of people, etc., so I could steer clear of it. Direction… Skyline. Lines. People come together. Music, converges….JAZZ!!! What does jazz look like though? Jeff Donaldson’s Jam Packed and Jelly Tight. Yep….wait…OMG!!! Great energy in the form of vibrant color. Shapes converging, a merging of the minds. Arrows, pointing at each other. Movement in the direction of progress that starts with you and me. Several drafts later… and the rest is history. This June, I decided to take National Fruits and Vegetables Month to the next level. 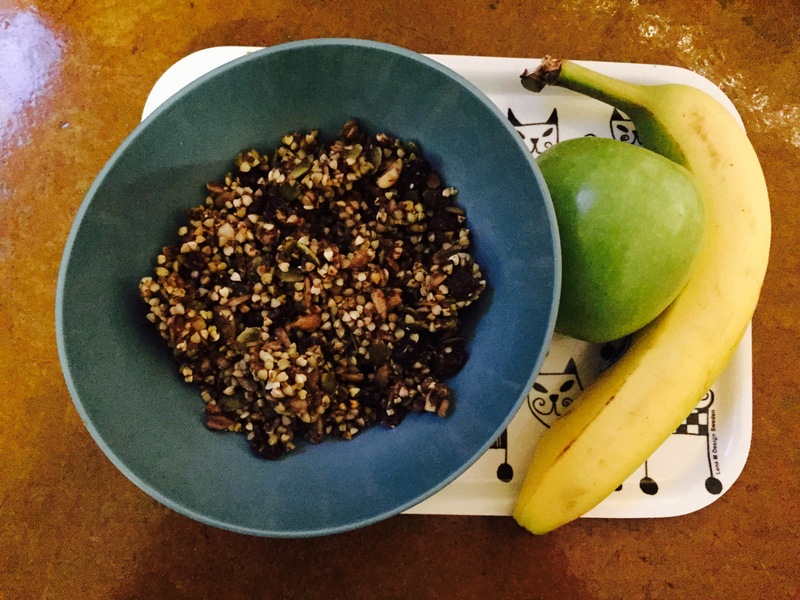 Inspired by the fresh produce enthusiasm this past June, I cleared out my kitchen cupboards and prepared for 30 days of a strictly raw-vegan food diet. I know the typical paragraph that follows these blog posts will give you some sort of exercise regiment; meal plan; weight loss goals, but that wasn’t what compelled to take the month-long challenge, and that isn’t what I want to share about my journey in sourcing my meals as locally, freshly and sustainably as possible. Raw food hasn’t been cooked, processed, microwaved, irradiated, genetically engineered or exposed to pesticides or herbicides. It includes fresh fruits, berries, vegetables, nuts, seeds and herbs in their whole, natural state. While it is no secret that a raw diet may result in rather immediate short-term or long-term weight loss, the raw foodist is far more interested in the natural enzymes and nutrients that are packed into uncooked foods, and how those individual ingredients are sourced. It can be considered its own food movement. Sound hungry at the thought? The potential benefits make it well worth the try. People have lots of reasons for getting involved: some are seeking a digestive cleanse; some are attempting to cure physical or mental ailments naturally; maybe a person is determining food allergies or trying to notice certain trends in food and feelings internally. There’s no one script and everyone arrived here in a different vessel, which is why it’s important to find what works for YOU. Here are a few tactics I implemented and highly encourage. Research food groups in advance. It’s important to maintain well-balanced diet. How else will you have the energy to get through the long workday? Learn what foods are best for which vitamins and minerals. If you know you don’t like raw spinach under any circumstances, then plan a substitute. The options are endless and the web is full of fast facts. One of the many things I learned, included the importance of being prepared. There was never a time of day where I did not have fruit, nut bars, and a variety of other raw snacks in my bag; at my desk; etc. Get prepped and stock up! It’s easier to clear out the kitchen cupboards and refrigerator before you start your raw journey. Keep waste down by using up all perishables before you begin your 30 Days. On the flipside, stock up on items you don’t typically use in your everyday diet. Changes for me included: raw honey, coconut oil, raw pepitas (and nuts of all varieties), cacao, and raw granola. I, personally, always bought my produce the morning-of my workday, but that is your decision. Your local farmers market is the best spot! Food is fuel. Listen to your body. If it’s not getting something it needs, then it will tell you. If you feel lethargic or nauseous, or if you’re confident you aren’t consuming enough calories in a day, make accommodations. You may even find you need to adjust your workout routines at first, until your body adjusts to the new diet. Be mindful. Notice what has changed over time with the incorporation of more raw foods, and less processed ingredients. It may be helpful to keep a journal to document how new or different foods initially make you feel. It’s also a good spot for all your new recipes and favorite ingredient combos! Whisk together the maple syrup, water, coconut oil, cinnamon, nutmeg, and salt. Pour over dry ingredients and mix them well with your hands. If you’d like to make a sweeter granola, you can add another tbsp maple syrup, or a few drops of stevia; the amount listed is intended only to add gentle sweetness and to bind the granola together. Dehydrate at 115 degrees for about 10-12 hours, or until granola is sticky but adhering firmly. Refrigerate till ready to use; this will help maintain crunch and texture! *Please ensure you are getting the appropriate vitamin and nutritional intake for your height and weight. Consult with a doctor or nutritionist before determining if this is an appropriate diet choice for your body.